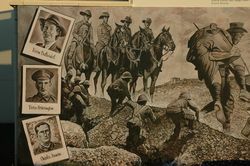 A mural commemorates those who served in World War One. 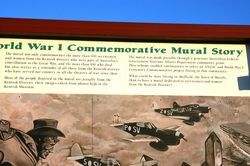 The mural was funded through the ANZAC Centenary Grants Program. 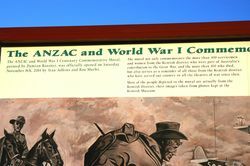 The ANZAC and World War I Centenary Commemorative Mural, painted by Damian Rossiter, was officially opened on Saturday, November 8th, 2014 by Stan Adkins and Ron Murfet. 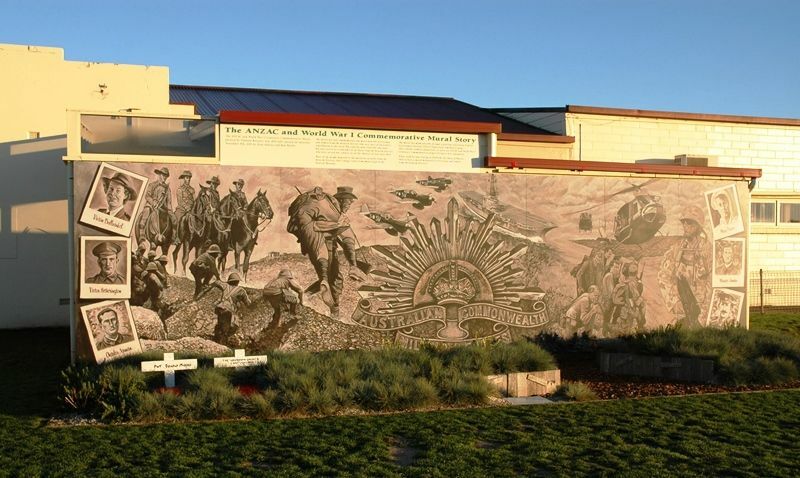 The mural not only commemorates the more than 450 servicemen and women form the Kentish District who were part of Australia`s contribution to the Great War, and the more than 100 who died, but also serves as a reminder of those from the Kentish District who have served our country in all theatres of war since then. Most of the people depicted in the mural are actually from the Kentish District, their images taken from photos kept at the Kentish Museum. 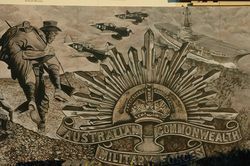 The mural was made possible through a generous Australian Federal Government Veterans Affairs Department community grant. 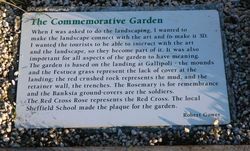 This scheme enabled communities to select an ANZAC and World War I Centenary Commemorative project fitting to that community. 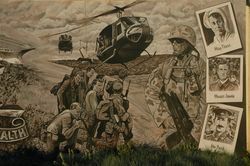 What could be more fitting in Sheffield, the town of murals, than to have a mural dedicated to servicemen and women from the Kentish District ? When I was asked to do the landscaping, I wanted to make the landscape connect with the art and to make it 3D. I wanted tourists to be able to interact with the art and the landscape, so they become part of it. It was also important for all aspects of the garden to have meaning. The garden is baed on the landing at Gallipoli - the mounds and Festuca grass represent the lack of cover at the landing ; the red crushed rock represents the mud, and the retainer wall, the trenches. 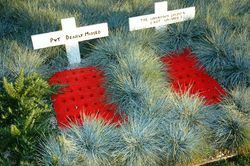 The Rosemary is for remembrance and the Banksia ground-covers are the soldiers. Rhe Red Cross Rose represents the Red Cross. The local Sheffield School made the plaque for the garden.